Iron Man 3 won’t be available on home video for another month, but Marvel has already debuted a deleted scene from the film which is slated to appear on the Blu-ray as well. Inside you’ll find a new scene of Ben Kingsley as The Mandarin as he prepares to deliver a new message to the world. For a full list of special features and additional material that will be found on the Blu-ray, click here. 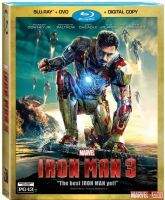 Iron Man 3 will be released digitally on September 3rd and on DVD and Blu-ray September 24th.